The southern mods make their way back to Langley Speedway this year not once but twice! The southern tour will help kick things off in 2014 by making their first stop on week two of the Langley season. It was a great turnout for this touring division that ran at the end of August. The only issue I see with this stop being so early in the season are the chilly spring nights. April nights can be right cold in these parts! Hopefully this will not keep the fans away! Just remember to bring a couple extra jackets and a blanket! Thankfully due to my work schedule I was able to attend this race in full! The meet and greet before the race was great. All the cars were lined up on pit road, drivers and crews were excited to talk to the fans, sign autographs, even let the kids sit in the cars! I remember the days my dad and I would go in the pits and I would climb in the cars. I loved the interactions! These guys heads were not up in the clouds like I have experienced with some drivers, they were willing to chat, answer question, very humble and appreciate the fan support. If you have never gotten the chance to check these machines out then mark your calendars. This season you will have two chances to check them out. The raw power, and design of these cars are incredible. It’s an experience I will certainly never forget. The mods were turning high 14 to low 15 second lap times on the newly paved Langley Speedway. The Newport News Shipbuilding/Bayport Credit Union 150 saw only four different leaders, an average speed of 96 mph and a divisions first time winner. Kyle Ebersole, driver of the #5 Ebersole Excavating Inc, captured his first win at Langley Speedway. Making him the fourth different driver to visit Dale Lemonds Victory lane in just four series visits. Kyle’s first win came in just 19 career starts, taking the lead on lap 137 on the outside coming out of turn four. 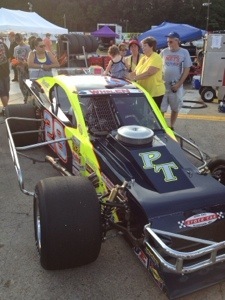 Look forward to both races being action packed as the Southern Modified series extends their series by four races in 2014. 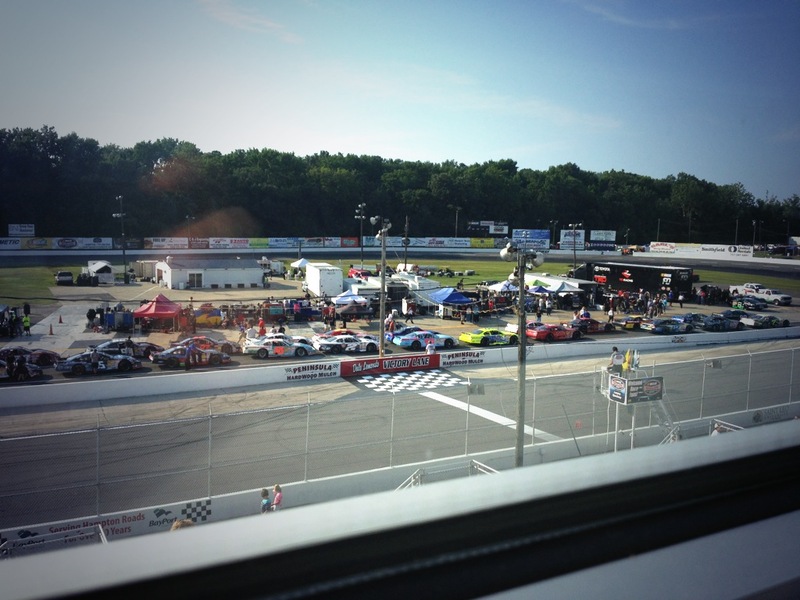 Incredibly excited the K&N Pro East Series is making its return back to Langley Speedway. This has to be one of my favorite races to come to my home track. I seriously feel it’s a flip of a coin between the K&N Series and the Hampton Heat race as to which is my favorite. There is no real professional way to put this but, I love the way the cars look on the track. No other way to put it. Dylan Kwasniewski’s Rockstar Energy Chevy was amazing under the lights! Sam Hunt’s #18, the black and green of Kenzie Ruston! The sounds of all the cars on the track are just music to my ears. Taking place the same time of the month as last year, middle of June will promise two things, a flash thunder-storm at some point in the day, and hot muggy weather. Last year mother nature claimed qualifying forcing the field to start by points. Kwasniewski started the Visit Hampton Va 175 on the outside pole. Took the lead spot on lap 96 after passing pole sitter Brett Moffit. After holding off Daniel Suarez on a green-white-checkered finish, Kwasniewski held on to take the Rockstar Energy machine into victory lane in just his first appearance at Langley Speedway. I am personally looking forward to seeing how new comer Lee Pulliam will do. One would imagine wining back-to-back national late-model titles he would be able to transfer that skill. New tracks and different cars could pose a threat. Look for Lee Pulliam in the #11 Hattori Racing Enterprises car to make quite the impression this season. Four other Langley Speedway divisions will be joining the Pro Series that evening. Langley’s Modified division will hit the track for 50 laps, Grandstocks will run for 40, Pro 6 will run 30 laps, and my best guess is the Wing Champ Karts will kick the evening off with a 20 lap feature. Times and ticket prices have yet to be released. I will keep you guys updated as they become available. Returning for its seventh consecutive year this event will again look to bring some of the best Late Model drivers from around the area. Never have I been let down by this race. Again nothing has been “officially” released but I would imagine up for grabs this weekend will be a huge cardboard check printed for $10,000 as well as the second leg of the VA Triple Crown. Cars begin to line up for qualifying. 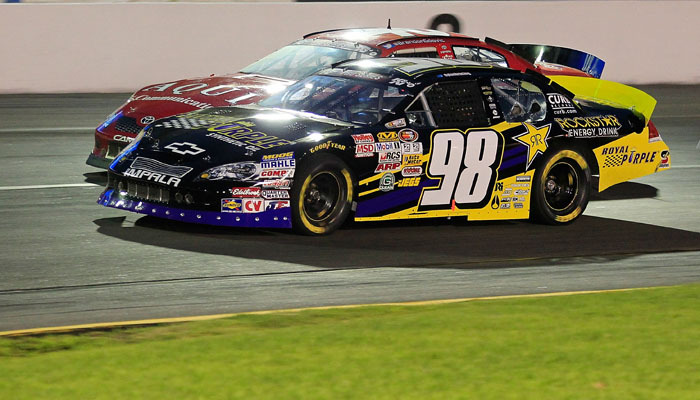 Thirty late-model stock cars took the green flag in last years installment of the seasons longest race. Quick Nick Smith put the TowneBank #77 car on the pole with Camping World Truck Series driver Timothy Peters taking the outside pole. I had the pleasure of enjoying this race from the comforts of a sky box thanks to my then future father in-law. I must say the only part I did not enjoy were all the cautions, but what would you expect with 30 of some of the best drivers jam-packed on a low bank .395 oval. The largest starting grid in the Hampton Heat history saw only a one second difference between P1 and P30! This was some of the best racing I have seen not only in the six previous races but in my time at the track. Twelve cautions and six extra laps later Peyton Sellers and the #99 machine roll into victory lane. Four other divisions will help make up the 300 total laps to be run that evening. My prediction is the night will start off with a 15 lap feature for Langley Speedway’s Bandolero division followed by a 20 lap feature for the Wing Champ Karts. Followed by a 25 lap shoot out for the INEX Legend division. The Super Streets finishing off the night at the conclusion of the late-model race for 40 laps. I will keep all of you updated as the season moves on to times and ticket pricing.